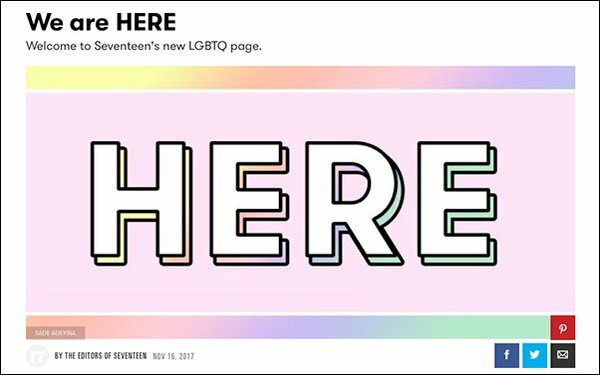 Seventeen magazine is launching a new, social-first brand for the LGBTQ community called Here. “This will be a space dedicated to LGBTQ readers and allies aimed at amplifying the voices of LGBTQ-identified teenagers—something the world is missing right now. Both a resource and a place for teens to express themselves, we wanted to build a community we wish had existed when we were growing up,” wrote the editors of Hearst-owned Seventeen magazine in a post on the site. Editors of Seventeen and LGBTQ teens and influencers will contribute content. Seventeen.com editor Kristin Koch told Fashionista that in the last year, the brand has shifted gears to become more social-first to better serve its "hyper-digital" audience. It has producied content for Snapchat Discover and original programming on YouTube and Facebook. "While there are many amazing resources and platforms for the LGBTQ community, many of which we're excited to work with, what we felt was missing was a place dedicated to young people who were exploring their identities and still coming out in the world," Koch told Fashionista. Last month, Condé Nast introduced its own LGBTQ-focused brand called Them, its first new independent title in a decade, created by digital editorial director of Teen Vogue and Allure, Phillip Picardi. Them is aimed primarily at Generation Z, the generation after millennials. Magazine brands created for the gay community have blossomed this year. In September, the publisher of marijuana-enthusiast magazine High Times, Oreva Capital, bought LGBTQ-focused titles Out and The Advocate. In August, gay hookup app Grindr launched Into, a digital magazine targeting millennial LGBTQ audiences.